Wanna play a prank on your friends? 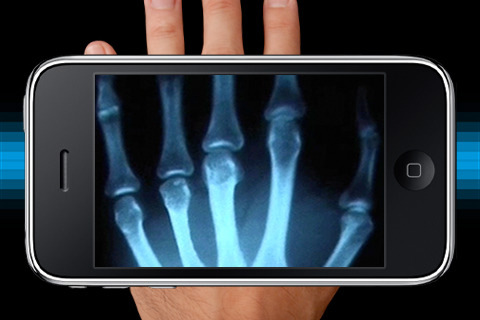 Load this xRay app, tell your friend to hold our his/her hand and hold it still. Hold your iPhone as though you’re using the camera to take their xRay as the video plays. You need to practice a few times so you can get your movements to match the video and create the illusion that the X-Ray is real. Tap either the hand or skull xRay button to begin. Wait for the xRay movie to load and trick them into thinking iPhone can take xRays! A paid version is promoted within the app which you really don’t need to be buying. AppSafari review of X-Ray was written by Joe Seifi on February 23rd, 2008 and categorized under App Store, Free, Fun. Page viewed 17627 times, 1 so far today. Need help on using these apps? Please read the Help Page. is it not true ?!!!! How much does this iphone cost in birmingham Aston. crazy question, but could this potentially be a portable ultrasound? I like and want to have in my iPhone 4. When could it be possible.